A Montage Of Talent From Ever Talented Cityscape Artist Tom Butler! This month we shine a light on the considerable talents of Tom Butler. Master of the mixed media cityscape. 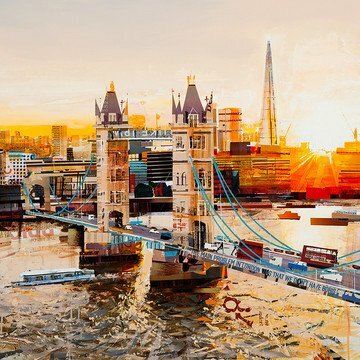 His creations are stunning canvases, focusing on the interpretation of urban landscapes and cities. His exciting work has a legion of enthusiastic fans. Both here at Collectors Prints and throughout the world. 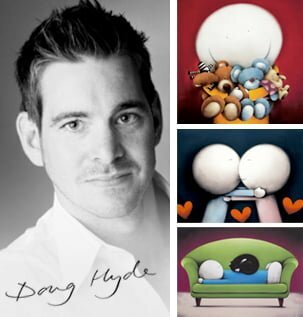 Tom studied Illustration at Swansea University in South West Wales, graduating with a first class degree in 2000. He initially considered pursuing a career in the commercial art world, stemming from a desire to illustrate books. He co-wrote, and illustrated, a picture book for children called ‘Horace and the Acrobat’ (featuring tales of a clumsy bat), with his grandfather. Although the book was made as a prototype, it unfortunately never made it through to publication. The prototype however, was passed on to his own children who love it dearly and very much enjoy reading it. Four years after his graduation, whilst on holiday with his wife in the South of France, Tom visited the small picturesque town of Uzès. It appears to have been love at first sight with him describing himself as becoming; ‘mesmerized by the light, color and texture of the place’. Tom was to find himself enormously inspired by the bright colours of the fabrics of awnings and parasols, juxtaposed with the dusty texture of aged and weathered stone buildings. He also realised that he was drawn to the ‘les publicités anciennes’ – oversized, relics of hand painted faded advertisements, sited amongst the crumbling masonry. His continuing fascination with the use of text within his work is still clearly apparent today. It’s no surprise that Tom describes 1930’s poster artist and typographer, A.M Cassandre, whom he studied during his degree, as a source of inspiration. From this experience emerged his fascination with the creation of cityscapes and his work began to evolve into the style with which he expresses himself today. Around this time he had his first solo show and also began to sell originals to galleries. But sales were initially sporadic and in order to support his family and pay the bills he had to find himself a day job, turning to painting and decorating, something that he credits with helping him to develop a good head for business. Tom now lives on the border of Berkshire, Surrey and Hants, with his family who play a huge role in his life. He does not have much spare time on his hands, but enjoys playing both tennis and the guitar. As well as being something of a whizz in the kitchen. His studio is located just down road from his home. This means both are well placed to enjoy easy access to both the distraction and delights of the capital, as well as the peace and restoration of the countryside. A bolt hole by the coast would be his dream home. Preferably in the South West. Devon and Cornwall feature high on the wish list, for the light, sea, space and architecture, as well as the clean air and the sense of community. Tom has allowed his style to evolve over the years. He is now best known for making collages into intricate and intriguing compositions. Since 2005, he has been used a method of creating mixed media with a process called ‘Lasertran’. This is something that he first began experimenting with during his degree course. It allows the transfer of photocopied material onto any surface. As well as creating collage, he also works with inks, pen and acrylics to achieve his final compositions. So skilled is his technique that the montaged aspect of his exciting work can be completely missed by a casual observer. One of the most exciting things about viewing a Tom Butler piece is the delightful opportunity to find tiny details hidden within the work. Whether humorous or poignant there is a feeling of gaining access to a secret world. Being privy to a private joke. 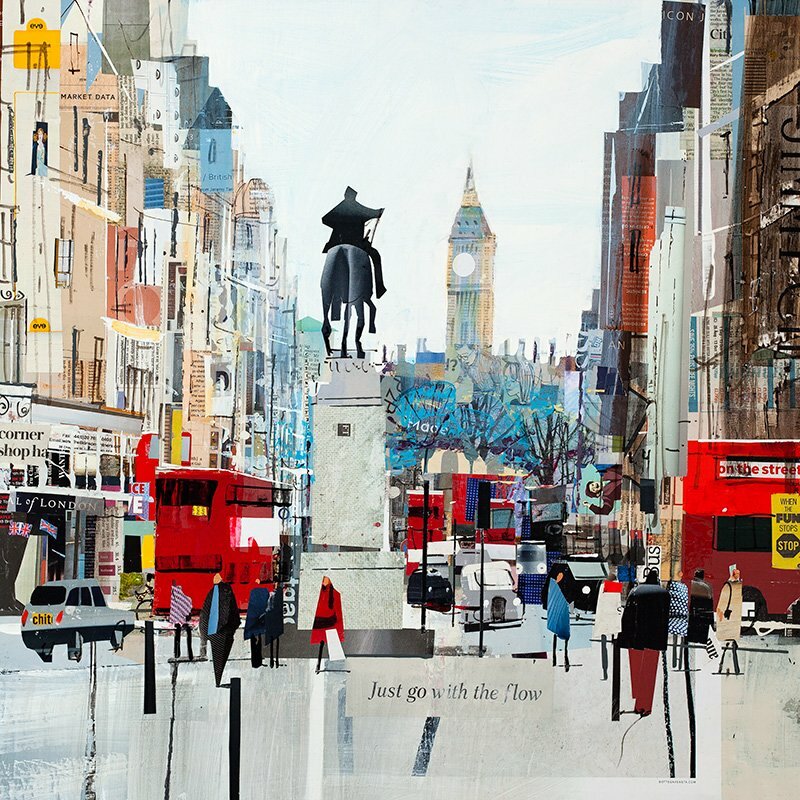 Whilst his subject matter has varied over the years, Tom finds himself greatly inspired by the iconic imagery of London. The famous red buses as well as the vibrant and inviting city lights. ‘London as a subject matter for a cityscape artist is a no-brainer. It gets plenty of attention and sells well in the commercial art world. The challenge for me is to find new and exciting ways of depicting our great capital city with its familiar icons, sometimes with an unusual colour palette or light condition’ (Tom Butler). 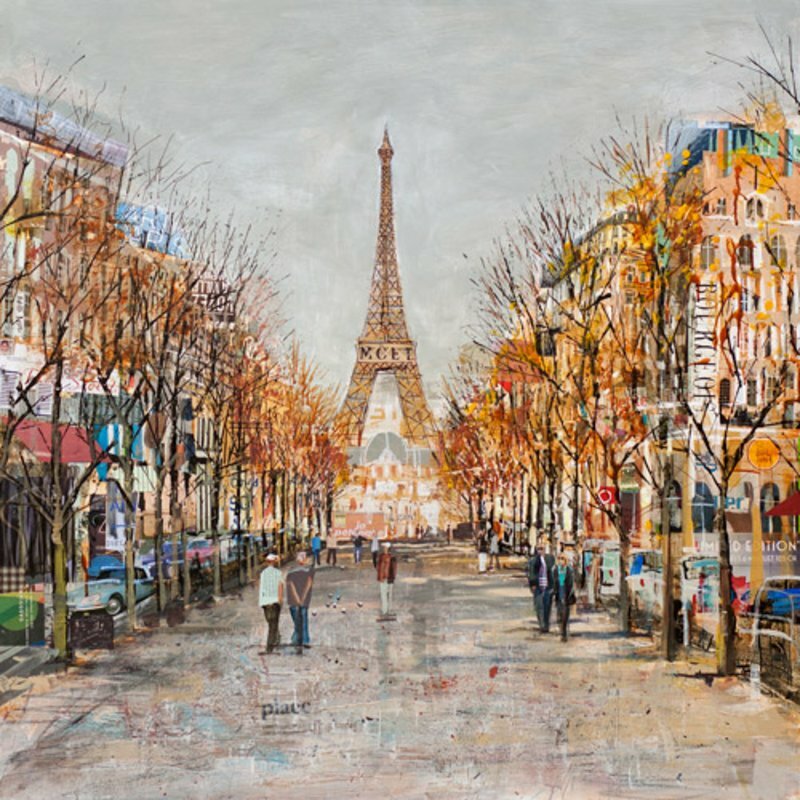 He also enjoys the creation of cityscapes based on the architecture of other cities of culture including; Paris, New York, Havana and Venice. Tom’s great belief in himself as an artist born to do exactly what he does. This means he is unlikely to be changing any time soon. His passion and enthusiasm for his art shines through in every piece. He has expressed a desire to dabble in portraiture created in his own unique style, something we at Collectors Prints would love to see! We are thrilled to be able to present Tom’s wonderful work, why not have a look for yourself?